What can I borrow from Washington County Cooperative Library Services (WCCLS) libraries? 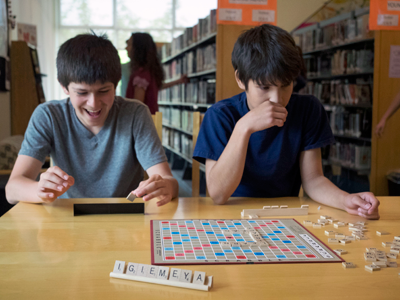 Your Washington County Cooperative Library Services library card is your key to over 1.6 million items ranging from books, magazines, music and audiobook CDs, DVDs and Blu-rays, e‑books and e‑audiobooks, and materials in many different languages. Cardholders may also access a variety of online indexes, full-text magazines and newspapers, reference sources and research databases, as well as e-books and e-audiobooks. How many things may I borrow from WCCLS libraries? Generally, cardholders may borrow up to 100 items at a time and have 50 holds requests. However, certain types of library cards and certain types of materials have special limits. For example, cardholders may only borrow and request up to 50 DVDs, 25 Blu-rays, and 10 electronic games at any given time. Most books and audio items are loaned for 21 days, and most DVDs and Blu-rays for 7 or 21 days. Other special materials may have different loan periods. By phone: Call (503) 846-3245 any time, 24 hours a day. Be prepared to enter your library barcode and password when prompted. Online: Visit any time, 24-hours a day through the WCCLS catalog. Click on Patron Account and enter your barcode number and password to access your information. In Person: Ask a librarian for assistance at any WCCLS library. Cardholders in good standing may renew most items for up to four additional loan periods if other library users are not waiting to use the materials. Click here to learn how. What happens if I don’t return items on time? Some library materials have a fine for each day the item is overdue. Most Adult and Young Adult materials have a fine of 25 cents for each day the item is overdue, up to a maximum of $5.00. Juvenile materials do not have overdue fines, but remember to return or renew items on time, as replacement fees will be billed for items that are not returned. Special items may have different fines applied. Ask your library if you have a question about a special item. Cardholders will be charged replacement costs and may also be charged for damages to items borrowed from the library. Replacement copies are not accepted. Borrowing privileges are suspended on accounts with $10.00 or more outstanding in fines and fees. As a courtesy, WCCLS sends a reminder 3 days before library items are due to cardholders who have selected to receive library notifications by e-mail or text. Return most materials to any Washington County Cooperative Library Services member library. The WCCLS Courier delivery system will return them to the owning locations.